I do love her lasts outfits. And she seems having a great time out with her hubby. Her red lips/nails combo, c'est simple but oohh j'adore! fly fly and even more fly!!! LOVe beyonce's style! Love that polka dot option. Her style does look better in some of these images that you have. I feel like most of the stuff the things hat she wears isnt wearable for the everyday woman. she look so good in paris. @Krisbliss I'm sure she doesn't use her stylist (his probably going crazy) lol, but I give her little credit for these couple days. WOWOOWOW!!! BEyonce is workin' it!!! She looks UNNNNNNNNREAL!!! Her style is off the charts hot hot hot! And Jay-z couldn't look any happier!!!!!!!!!! They are the BEST!!!!!!!!!!!! I love this post. I must say she has upped her fashion game. Haha last summer I noticed she adopted a "hipster" sense of style, she has really upped her game! I love outfits 4 and 5! Bey always kills it!I love how she is always switching up her style. I so agree, girl is lookin' HOT lately! I really really like that polka dot outfit she's wearing. Her outfits are usually hit or miss for me, but she's certainly stylish! Sometimes her outfits are to die for! I love Beyonce!! I follow you! that ruffle top is waaay too pretty! You are too adorable. I'm now a follower so I can keep up with you! I usually like her style but for the past few months I haven't really kept up with what she was wearing. These past few days though, I've seen a lot of pictures of her and she looks amazing! oh you are so pretty. i follow your style. what do you think of our blog? she HAS been rocking some awesome ensembles. In particular, I love the floral looks, and that skin tight maroon/green with polka dots combo? Insane. Love it. Probably would come off super hokey or Christmas-ish on someone else, but she kills it! I love the dress green and red. 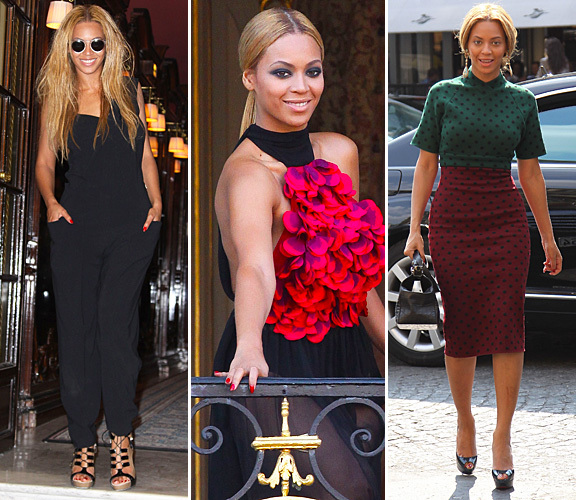 beyonce is so chic! and she has a rockin bod! I kind of only like that black jumpsuit! But I do like the shape of her dotted look! I'd have to say I like all of your looks though!! I love her outfits ! She has the dopest style ever! She looked amazing on her recent trip to paris! Hiii!! thanks for pass for my blog and comment!!! =) I like Beyonce´s style too!! 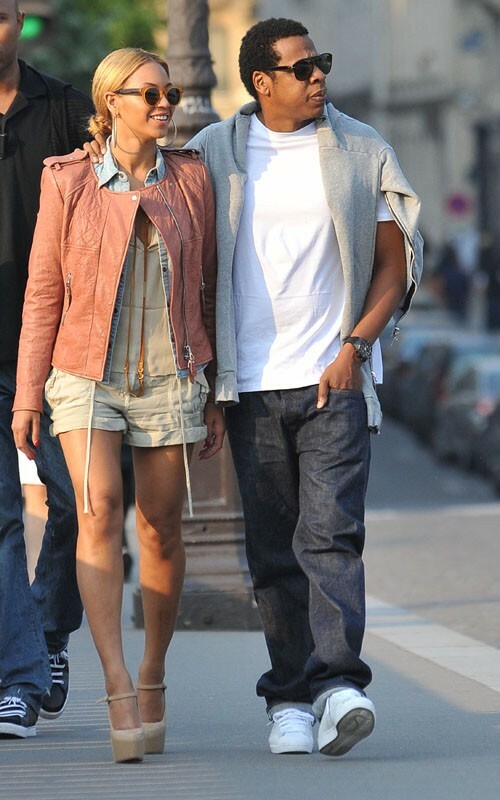 Her and Jay-Z are one of my favorite couples!!! She is (sasha) fierce! Get it?! she's got wild style - love how she takes risks! You're right! Looks like she has a new stylist. The last outfit ist stunning. Love her style.. Follow you now. If you have a minute, follow back? 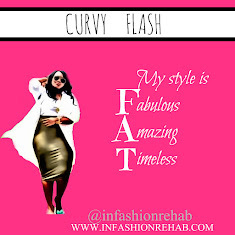 She is such a beautifull woman, and her curves are to die for! i love B but totally not diggin her hair at all! Great beyonce images love looking at them! I adore Beyonce ! I also love your blog, from the name to the content you have here =) Hugs from Italy ! wow!! she looks incredible. the last one is especially different from her normal style - liking it. i soo love Beyonce! she's very classy, and she always looks fabulous and chic! i love the black jumper and the polka dot dress! damn, she's hot! My Boo's wife really stepped up her game while in Paris, loves!